Seems like we just finished our December holiday shopping and here comes Valentine’s day. The stores are full of gifts for the occasion. Advertisements saying, “Follow Your Heart” and “Share The Love With [Insert Gift Suggestion]” abound. Just because the calendar says it’s February 14thand Valentine’s Day doesn’t mean you have to be sucked into the Hallmark holiday. Gifts and experiences don’t have to break the bank. There are many ways you can show your love to another person without having to spend big bucks. Here’s how to give gifts without breaking your budget. Set A [Mutual] Budget –At the beginning of the year, list out each holiday, and each person you have to buy for in a Word Document Table or Excel File. Set a budget for each person. For spouses, and siblings, nieces and nephews, you can set a mutual budget. Get A Gift Closet– I love the idea of a gift closet. In my case it’s actually a large drawer in my home office. Set aside your own personal space to capture gifts throughout the year. As you see something you know someone on your list will love on sale or otherwise, grab it and put it in the “Gift Closet.” You can also put gifts you received that you intend to regift in this space. Shop The Sales– A friend of mine’s father’s all around favorite gift is an iTunes gift card. Each year at Christmas she grabs a discount multipack of them at Target or BJs. They go into the gift closet. Each dad-related holiday: his birthday, Father’s Day, etc., she grabs a gift card from the closet. Or maybe it’s a teen who has a full, technology-laden wish list by September each year. As soon as something they wants goes on sale, grab it. HINT: If you are buying tech, including video gaming systems and games, purchase an extended warranty. It will cover the period it stays in the gift closet and then some. It Doesn’t Have To Be Diamonds– The old saying “It’s the thought that counts” is true. A good friend of mine is remarried five years. Her husband has never given her a diamond. Instead he pays attention to his wife’s musings throughout the year about things she plans to get “someday.” Every year he buys her something she has repeatedly mentioned from her “someday” list. Every year my friend is floored and amazed that her husband knows her so well. Choose a gift that fits what you know about the giftee. Choose A [Mutual] Theme – This works great for siblings and significant others. Agree to give each other a certain item, or an item in a certain theme, each holiday. This can be t-shirts, pajamas, mugs, or anything else you can think of. Choosing a theme and a specific item to give each other eliminates the “I don’t know what to get them” conundrum and helps keep you on budget. Gift Basket– This one works great for Bridal and Baby Showers. Think of all of the things a new couple and/or a new baby needs and create a custom gift basket. Find a pretty basket and start filling it with items that you know that person loves. It could be a themed basket such as spa treatments they can do at home or if the person loves to cook, it could be gadgets to make cooking easier or ingredients to create a really special meal. Hand Written Note– One of my favorite Grandparent Gifts is the handwritten note and photo combo. This works for anyone. Write a note to your loved one. If that is hard to do, pull down a couple photos from Facebook or your Smartphone and make a collage in Microsoft Word with a caption under each. This can be pictures of you and that person, or pictures of, in the case of grandparents, the grandkids. 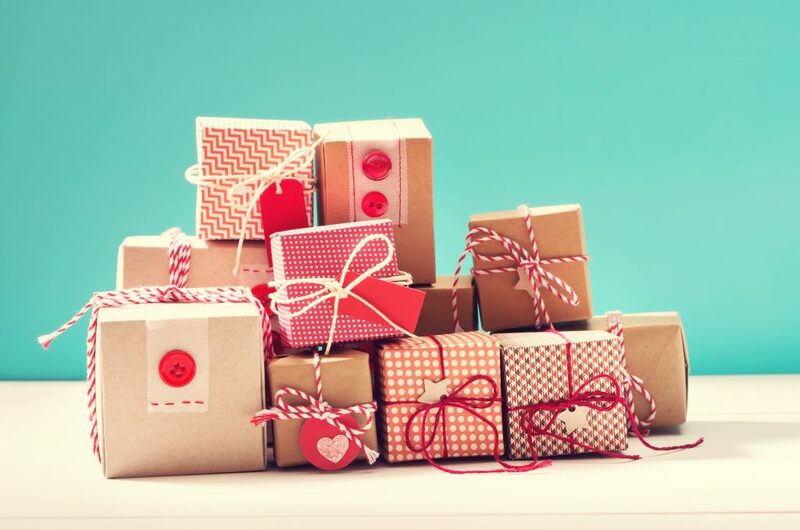 In today’s connected world, it’s very hard not to be sucked in by smart marketing campaigns and miss the important thing: the person you find important enough to give a gift to. By keeping it really personal, your gift will mean more than the standard chocolates and flowers. Remember, love is in the everyday little things.